In the terrible aftermath of the Las Vegas massacre people have been urgently trying to explain it. Some have put race at the centre of their explanations. Mass shootings, they argue, reveal something sinister in the heart of whiteness. This is not to say mass shootings committed by white men might not be distinctive in some respects. Nor does it preclude a racial double standard in how their atrocities are reported or perceived compared to those of others. But it does indicate that mass shootings themselves are not an inherently white problem. Why is it then, that many people see a causal connection between whiteness and mass killings? Part of the answer may come from the searing recency of the Las Vegas killings and their white perpetrator. Part of it may come from the vexed links between race, US politics and gun culture. And part of the answer may be found in the typical colour contrast between mass shootings and mass killings committed by Islamic extremists. Another part of the answer may involve a bias in how people judge associations between two phenomena. Humans often perceive “illusory correlations” where none exist objectively. There is evidence from cognitive psychology this is especially likely when one of the two phenomena is highly prevalent. In a study published in 1998, participants were given information about 60 fictitious patients. Each patient was described as either having or not having a made-up disease (such as van Ork’s disease) and as either having or not having a made-up symptom of the disease (such as swollen joints). Participants were then asked to judge how strongly the symptom and the disease were correlated. Participants were assigned to several different experimental conditions, which differed in how prevalent the disease was among the fictitious patients. But when it came to the symptom, in two of these conditions there was no correlation at all between symptom and disease, meaning the symptom was equally likely to occur whether the disease was present or absent. In the low prevalence condition the disease was present 30% of the time. The symptom was present in half of these cases and absent in the rest. In the high prevalence group the disease was present 70% of the time. Again, the symptom was present in half of the disease cases and also in half of the no disease cases. Participants in the low prevalence condition group correctly judged that there was no relationship between symptom and disease. But those in the high prevalence group saw a correlation between symptom and disease that simply did not exist. The likely explanation is that participants paid special attention to cases where the symptom and disease co-occurred. This happened only nine times in the low prevalence condition, but 21 times in the high prevalence condition. Seeing symptom and cause occurring together so often led people to believe they were associated, although they were not. The analogy to race and mass shootings should be clear. The shootings are the symptom and, in the eyes of some, whiteness is the disease that causes it. There is no actual correlation between being white and being a mass shooter in the US, but because whiteness is common we see many examples where the symptom and the disease go together. 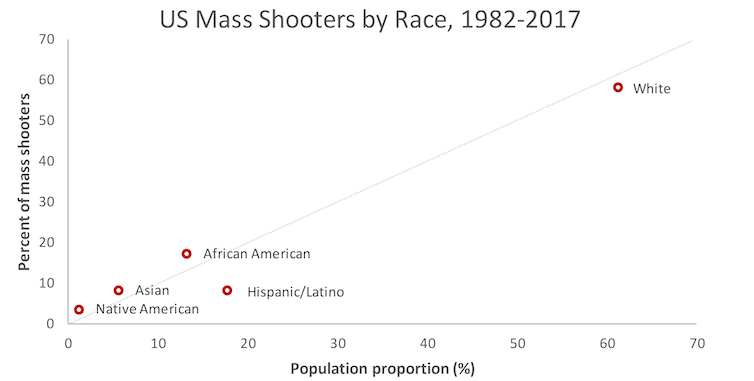 As a result, mass shootings are seen as linked to whiteness. In this case, the diagnosis is incorrect. The problem is not white men, but men. So, not race, but gender. Only two of the 91 mass shootings were perpetrated by women.